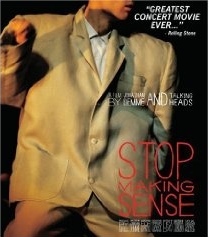 One of the best concert films of all time gets its hi-def due with this lovingly curated reissue “Stop Making Sense.” Directed by Jonathan Demme, “Sense” captures the Talking Heads at their squirrelly best, spasmodically jumping between new wave, funk, and arty Afro-pop with a crack band of ace sidemen that included Bernie Worrell, Alex Weir, and Lynn Mabry. The Talking Heads found their footing slowly, evolving from willfully experimental Rhode Island hipsters to a merry band of world music vagabonds, and Demme frames their journey with a stage setup that opens slowly; for the opening number, “Psycho Killer,” David Byrne comes out with nothing but his guitar and a boombox. He’s joined by bassist Tina Weymouth on the next number, they’re joined by Chris Frantz next, Jerry Harrison follows Frantz, and so on and so forth, until the whole entourage is under the lights, making the most joyously paranoid racket of the ‘80s.